The SPA2 12 in GTA Vice City. 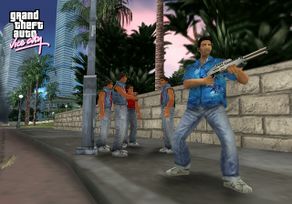 Tommy Vercetti wielding the SPAS 12 in Grand Theft Auto: Vice City. "Extremely powerful shotgun. Could stop an elephant. And has. Used in Vice City on other things. With devestating results." The weapon's gas-powered repeater system generally holds seven shells in the undertube of the gun. The gun shoots in a fully automatic mode in the GTA Vice City rendition, however this feature was removed in later installments, presumably to curb the gun's power. The shotgun is not commonly found throughout the games; in GTA Vice City, only one Ammu-Nation sells the gun, at the extreme price of $4000, with a similar situation in GTA San Andreas. In GTA Liberty City Stories, the gun can only be obtained through one spawn location. This weapon is spelled as "Spaz 12" in the original PS2 version of GTA Vice City and in GTA Vice City Stories; and as 'S.P.A.S. 12' in later versions of GTA Vice City. Downtown - Available to buy from Downtown Ammu-Nation after completion of Bar Brawl ($4,000). Escobar International Airport - Behind the Vice Surf billboard across from the EIA Main Terminal Building. The Four Dragons Casino, Las Venturas - Spawns outside the casino after collecting all 50 horseshoes. Wichita Gardens, Shoreside Vale - Spawns behind an Ammu-Nation billboard just west of the park. Ocean Beach - Available to buy at the Ammu-Nation store costing $4,000 but decreased to $3,000 after completion of Phil's Shooting Range. Ocean Beach - North of the helipad by Lance Vance's home next to a house surrounded by bushes on all sides. GTA Vice City, GTA San Andreas, and GTA LCS. The Spas 12 in real life. The actual SPAS 12 shotgun is seen in GTA IV's loading sequences; artwork shows two NOOSE officers holding SPAS 12s, with one firing an MP10. This page was last modified on 28 January 2013, at 21:01.